58Gin - Hand Crafted, Premium Artisan Gin. From humble & unorthodox beginnings, to a refined & sophisticated award winner. A sophisticated flavour combination providing a wonderful balance between citrus & savoury. 58 Gin is produced in a traditional manner using beautiful alembic copper stills. 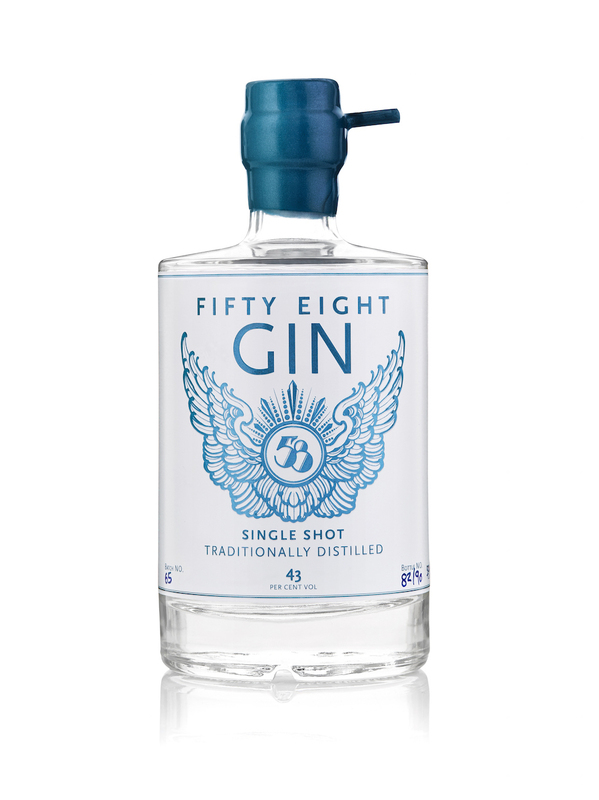 The distinctive smooth and clean taste of 58 is largely down to the single shot distillation process where the head and tail parts are cut off (the spirit produced first and last in distillation) leaving more of the heart. This removes any initial sharpness or unpleasant aftertaste and is replaced with a crisp taste and a soft finish. Born of a passion to experiment and with beginnings rooted in an unorthodox background, 58 Gin strives to create the best in hand crafted, premium artisan gin. Traditionally distilled in small batches to ensure that every drop is perfectly balanced, 58 Gin continues its ambitious philosophy to become the gin of choice for elite bartenders and discerning consumers. The very essence of gin, adding resinous notes of pine. Savoury, but with citrus notes and used in small amounts. Floral with notes of liquorice, used to hold the perfume notes within the liquid. A mild curry flavour, with crisp celery notes. Peppery, menthol notes reminding Mark of walking through a Eucalyptus forest back home. A sweeter variety of lemon adding light and bitter notes. Provides the perfect balance between dry and sweet. Sharp and fragrant notes and is used sparingly. Strong and creamy, rounding off the taste profile. Lawbreaker, rule bender, pioneer & gentleman. One man's journey to create the perfect gin. The 58 Gin story began when Mark Marmont moved to London from Australia. But it wasn’t until settling near to The Bar With No Name, that Mark discovered what would become his true passion. Shortly after arriving in London, Mark became a frequent visitor to the bar, sampling the multiple gin-based cocktails on offer. Before long, Mark was fully immersed in investigating the distillation process and exploring how gin was made as he couldn’t find a gin that he liked. In the couple of experimental years that followed, Mark became affectionately known as ‘Moonshine Mark’ by the regulars at the bar. It was during this time that he perfected the recipe, and 58 Gin was born, named after Mark’s house number.